The plan by whistleblower website Wikileaks to release millions more classified US documents will put lives at risk and damage national security, the state department has warned. A spokesman said it would do harm to US international relations if the leaks contained diplomatic cables. The Pentagon said US military interests could also be damaged. 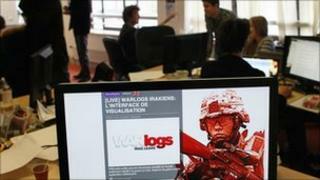 The Wikileaks website said the US authorities were afraid of being held to account. The state department spokesman, PJ Crowley, said the release of confidential communications was "harmful to our national security. It does put lives at risk. It does put national interests at risk". Mr Crowley said that diplomatic cables involved discussions with governments and private citizens, and their release could erode trust in the US as a diplomatic partner. "They are going to create tension in relationships between our diplomats and our friends around the world," he said. "When this confidence is betrayed and ends up on the front pages of newspapers or lead stories on television or radio, it has an impact," Mr Crowley said. He said the state department had known for some time that Wikileaks had obtained some of its classified documents. He said Congress had been warned of the impending leak and that US diplomatic missions around the world had begun notifying other governments that it could happen within days. "We wish this would not happen, but we are obviously prepared for the possibility that it will," he said. A Pentagon spokesman, Col David Lapan, said the defence department had also notified congressional committees of the expected Wikileaks release. He said that although the files were believed to be state department documents, they could contain information about military tactics or reveal the identities of sources. A statement on the Wikileaks Twitter site said: "The Pentagon is hyperventilating again over fears of being held to account." Wikileaks said on Monday that it planned to release seven times as many documents as it released in October, when it posted some 400,000 documents about the Iraq war on its site. It would be the third mass Wikileaks release of classified documents after it published 77,000 secret US files on the Afghan conflict in July. Wikileaks argues the release of the documents has shed light on the wars, including allegations of torture and reports that suggest 15,000 additional civilian deaths in Iraq.